Every spring after pruning, grapevine sap of clear color oozes from the cut stems, making it look as if the vines are crying, mourning, hence the very poetic name: tears of grapevine or bleeding grapevine. This phenomenon was believed to possess magical implications as people would use the grape sap to cure a variety of medical conditions, ranging from skin problems, rashes, indigestion and even snakebites. Even nowadays, there is a strong belief, especially among older people, that grapevine sap possesses incredible curative properties. Grapevine sap has come to the attention of modern medicine after it became known that it could cure eyesores, acne, bowel upsets and prevent open wounds from getting infected. 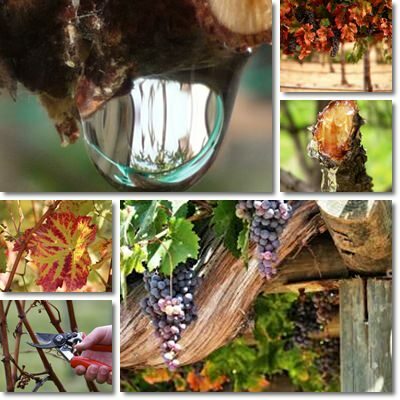 Recent research into the properties and health benefits of grapevine sap has come to some surprising results: it appears that grapevine sap, the clear, watery liquid dripping from freshly pruned grape vines has amazing antimicrobial, anti-inflammatory and astringent properties. Even more, grapevine sap contains viniferine, a potent natural substance which can restore radiance to one’s skin. 1) Grapevine sap is a potent anti-inflammatory as well as antiseptic agent. Traditionally, grapevine sap was used to treat conjunctivitis, blepharitis (swelling of the eyelids) as well as any form of internal or external styes. For the treatment of conjunctivitis and internal styes, the sap was dripped into the eyes every morning and evening until the eyes returned to their normal state of health. Blepharitis and external styes were cured by washing the eyes with freshly collected grapevine sap (see article on eye styes: causes, symptoms and treatment). Additionally, sap was dripped into the eyes as well so as to prevent the spread of the infection. Although scientific evidence supports the claim that grapevine sap is a potent anti-inflammatory and antiseptic agent, when dealing with delicate medical conditions such as eye problems, it is always wise to ask for your doctor’s advice first. 3) Grapevine sap helps detoxify the liver and has powerful diuretic properties. Traditionally, people suffering from liver or kidney problems would drink a cup of fresh grapevine sap every morning before breakfast in order to purify the blood, detoxify the liver and improve kidney function. The sap contains minerals, sugars and phytochemicals meant to protect the vine from frost damage and help buds develop in spring. This sort of purified water, full of nutrients, was believed to have positive effects on human health and promote blood and liver detoxification. Below is a video filmed today, 8th of April 2018, and you can see a tiny sap drop dripping from the grapevine. The liquid looks clear like fresh spring water and can be collected by attaching a small glass bottle to the grapevine for several days. Not all vines will produce the same amount of sap, so it’s ideal to collect it from several different places to make sure you get a decent amount. What is interesting is that in the past women would wash their face every spring with fresh grapevine sap. My grandmother herself claims that the sap kept her skin free of age spots, dark circles under the eyes and blemishes and made her look fresh and radiant. But how does viniferine work? Viniferine improves circulation and harmonizes melanin production, thus ensuring no dark spots appear and the skin preserves a healthy glow. Conclusion. Grapevine sap is a natural substance, a sort of purified water rich in nutrients, particularly minerals. It can be said that its use can cause no harm, especially if it is external. However, my advice is to always ask for a doctor’s advice if you are planning on resorting to any form of alternative medicine, especially if you are already dealing with a medical problem. Aside from this, it is said to do wonders for the skin in particular and I admit that, if I could get my hands on some fresh sap, I would be extremely eager to wash my face with it and see myself putting on a beautiful, healthy glow. I have over a half gallon of grapevine sap I collected today. How long is it good for? Does anyone need any? Hi, Darryl. It really depends on how you store it. Grapevine sap needs to be stored in clean glass containers, preferably not transparent and closed up really well. It should be stored in cool places like a cellar. Air, light and heat can spoil it. It should be good as long it doesn’t smell badly or turn a yellowish or greenish color. As for the anyone needing it part, you can have your wife or girlfriend or a girl friend test its properties if she wants by washing her face with it every day to make it look brighter and give it a healthy glow. I’d love some. How did you get a half gallon? Hi, Mark. I collected my grapevine sap from my grandparents’ small vineyard by attaching small glass bottles to the grapeveins. It took me a couple of days to collect the sap. hello, can you send me some grape vine sap. I will pay for it. Hello, Segandra. This website does not sell any product or service. Grape sap is freely available in Canada. That’s great to know, Paul! You can also get grapevine sap from your own grapevine if you have some older plants. What varieties of grapes work best for this? Hello, Don. I’d say all grape varieties. Grape varieties grown especially for wine production as well as table grape varieties yield grapevine sap. A friend gave me frozen grapevine sap in sterilized cap sealed plastic gallon containers. It is harvested in the spring then stored in a freezer. Do you think freezing changes the bioavailability? Some have a bit of yellow tint. My husband is drinking 6-8 oz a day for antioxidant benefit. Hi, Jeanne. While freezing is a great method for storing food and other products, it does not prolong shelf life indefinitely. Typically, the longer a food or other product has been frozen, the more of its initial qualities and medicinal properties it stands to lose. Granted, some products take kinder to freezing, others not so much, but all have an expiration date. This being said, the yellow tint may or may not indicate a change in its therapeutic properties. I’ve had grapevine sap turn yellowish as it got older than 4-6 weeks and was briefly exposed to sunlight. However, this doesn’t mean yours has had the same thing happen to it. Or that it isn’t good any longer. Ideally, it’s better to use grapevine sap as fresh as possible and discard it if it acquires a smell or color (compare with a freshly obtained sample – maybe your friend will allow you to collect some yourself next spring and this should really help you have a better overall understanding of grapevine sap). As for the antioxidant benefits of grapevine sap, research shows it’s rather limited to benefits for skin when applied topically. I am not sure if your husband may enjoy other more pregnant antioxidant health benefits from drinking grapevine sap. If he does this to help him with a medical condition, then please ask him to see a doctor before resorting to any form of alternative treatment. Sure, grapevine sap is a sort of purified water with minerals and special antioxidants with beneficial effects on skin mostly, and consuming it should not pose any major health risks. But if your husband is to use it this way, then it’s important he be sure the sap he’s having comes from uncontaminated soil and grapevines that haven’t been treated with pesticides and other similar products. Because these are basically toxins and have a way of getting into plants and the edible products and, from there, into our bodies. Over time, it’s not a healthy acquisition. Thank you so much for your comment, Jeanne, and wishing you and your husband lots of health!